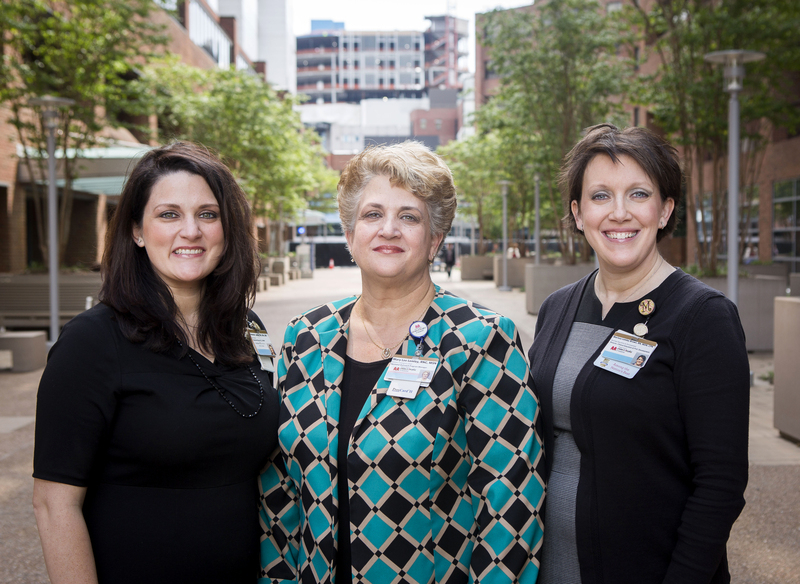 Editor’s note: Many VUMC employees have a parent who also works at the Medical Center. 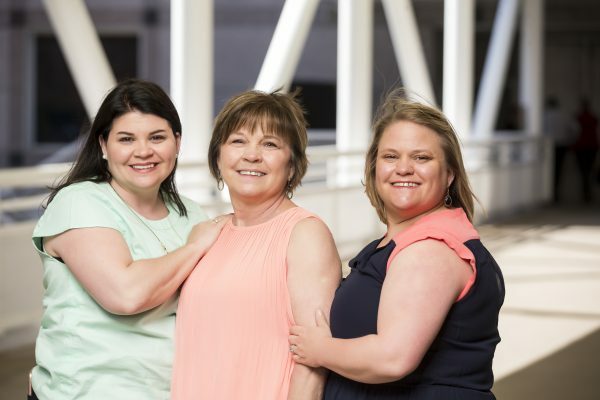 For this Mother’s Day, VUMC Voice is featuring a few of these special mom-and-daughter and mom-and-son pairs. Robin Steaban and daughter Milli Vincent. Robin Steaban, MSN, RN, Chief Nursing Officer for Vanderbilt University Hospital and Clinics, and daughter Milli Vincent, associate director of Business Operations for VUMC IT, rarely see each other at work, but when they do it’s a fun surprise. Several months ago, the two both worked in the Command Center during eStar’s go-live launch. “I was drawn to Vanderbilt because of the culture that I knew existed here from being raised in the VUMC community,” said Vincent, who has been at VUMC for six years. “Even though I work in an entirely different area (than Steaban), coming to Vanderbilt felt a little bit like coming home for me. 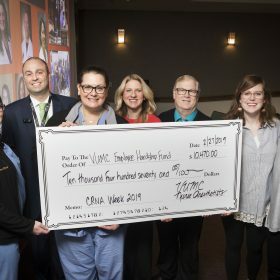 While VUMC has had tremendous change since mom joined the organization, it is refreshing to be a part of an organization that has maintained its cultural integrity. For me, the best part of working at the same organization as my mom has been the built-in sounding board,” Vincent said. Janet Cross, Administrative Director of Patient and Family-Centered Care in Child Life Services at Monroe Carell Jr. Hospital at Vanderbilt always excelled in her role as Mom, according to Lacey Cross, MSN, FNP-BC, a nurse practitioner with Vanderbilt Health at Metro Nashville Public Schools. But it wasn’t until Lacey came to work at VUMC seven years ago, for the pediatric nurse residency program, that she realized all Cross means to VUMC. Tanya King-Temple, RN, MSN, her daughter Breana Wiggins, and Breana’s husband, Eli Cutshall, enjoy working for VUMC. Breana was only 12 when King-Temple, Medicine Admissions Coordinator for VUMC’s Patient Flow Center, started working at VUMC 12 years ago. Breana, a bed management specialist, works in the same office (Green Hills) as her mom. Eli, a patient transporter, works on the VUMC campus. Both joined VUMC in March. “The best thing about having family working at the same organization is we can carpool to work and/or have lunch together,” King-Temple said. 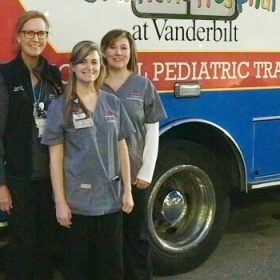 Alexis Brinsko, RN, MSN, in the Nurse Residency program in the Pediatric Medicine and Acute Care unit at Monroe Carell Jr. Children’s Hospital at Vanderbilt, has quite a few connections to VUMC. She was born here in 1992, currently works here, and is the daughter of Vicki Brinsko, MSN, RN, director of Infection Prevention for VUMC. “Our paths cross occasionally,” said Vicki, who has worked at VUMC since 1986. “I give talks about various aspects of infection prevention that nurses attend. I like the fact that we can ‘shop talk’ about our day and we both get the references. Alexis definitely gives me unabridged insight into the frontline nurse view point. I think we both marvel at working in a world class institution with the best (Magnet) nursing program and the best Infection Prevention program (Association for Professionals in Infection Control and Epidemiology Program of Distinction,)” Vicki said. 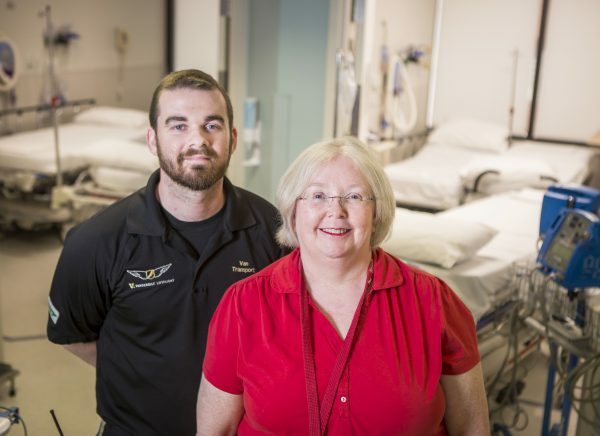 Clara Collins, an administrative assistant and Computer Access Security Manager for VUMC’s Perioperative Services, and her son, Brian Collins, who works in LifeFlight Ground Transport, have a long history with VUMC. Clara, who has worked here for 43 years, was 17 when she first set foot on campus. Brian was born at VUMC when Clara was 31, and now works here. The two don’t see each other often, but have lunch together when they can – sometimes she drops lunch off for him on her way back to her office and sometimes Brian brings his Mom lunch when he has extra time. “We both enjoy helping others and we are glad to know that we are here for each other as well,” Clara said. Debra Hawkins, RN, a nurse in Vanderbilt University Adult Hospital’s Post Anesthesia Care Unit, is the proud mother of two “fabulous” Vanderbilt nurses: Kendra Bristow, RN, based in Vanderbilt University Medical Center’s Neonatal Intensive Care Unit, and Amanda Lyles, RN, MMHC , Kidney Transplant Coordinator in the Vanderbilt Transplant Center. 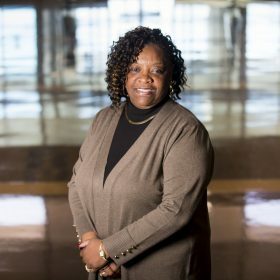 “Working here gives us the unique opportunity to have our own family be part of a bigger family,” Lyles said. Bristow adds the three often enjoy Vanderbilt sporting and family events together with their spouses and children. Do you know of other VUMC employee family groups — fathers and sons or daughters; spouses; siblings, or others? “VUMC Voice” is interested in hearing about VUMC families for potential future features. Send word to VUMCVoice@Vanderbilt.edu.